Firstpost Newspaper that is set to hit the stands on Republic Day morning has made a pitch to advertisers. It has released an AV featuring a TV film and the key details of the product. There is also a sales kit consisting of the brochure, a miniature copy of the newspaper, a covering letter and events to be organised by Club Firstpost targeting top advertisers. The launch has been backed by an extensive media campaign covering TV, print, digital, OOH and social media. The TV campaign includes 16K+ secondages across channels like CNN-News18, CNBC TV18, History TV18, FYI TV18 and Colors Infinity. In Print, it has slotted 2 to 3 ads in each of the magazines like Forbes, Overdrive, Better Photography and Better Interiors. Across the Digital medium, Firstpost has placed 120 million+ Impressions across News18.com, Moneycontrol.com, FirstPost.com and CNBCTV18.com. In the OOH medium, the campaign has been spanned across 6 weeks covering across 30+ premium screens in Mumbai and Delhi. The campaign also covers kiosks at Mumbai Airport for 3 months. Apart from Social Media Posts and Cover Pics on FirstPost.com, several activities and events have been planned. There will be 24 events in one year at Delhi and Mumbai. Intimate discussions of 100+ audiences with thought leaders have also been scheduled. There will be a unique opportunity for readers to experience on-ground realities of the election campaign. About 25 selected readers will be invited to visit the most controversial constituencies across the length and breadth of the country. As part of the schedule for Agency Branding, a 15-days campaign will cover key media agencies across Delhi, Mumbai and Bangalore. Media planners will be engaged across 15+ key agencies. The campaign will also cover trade magazines like Impact. Digital Web Banners or Mailers will be published from key media portals like E4M. A select club of insiders will get a chance to be privy to a ringside view of the drama and trends of Indian politics. The cover price of the 20-page newspaper has been fixed at Rs 8 per issue. At least 75 per cent of the copies will be sold via subscription. The Annual subscriptions will cover the Weekly newspaper, Online subscription to Firstpost and Membership of Club Firstpost, which includes a year-long programme of specially curated events. Positioning itself as the last word on news, Firstpost will be a 20-page broadsheet appearing every Saturday and shall cater to readers in Mumbai and New Delhi. 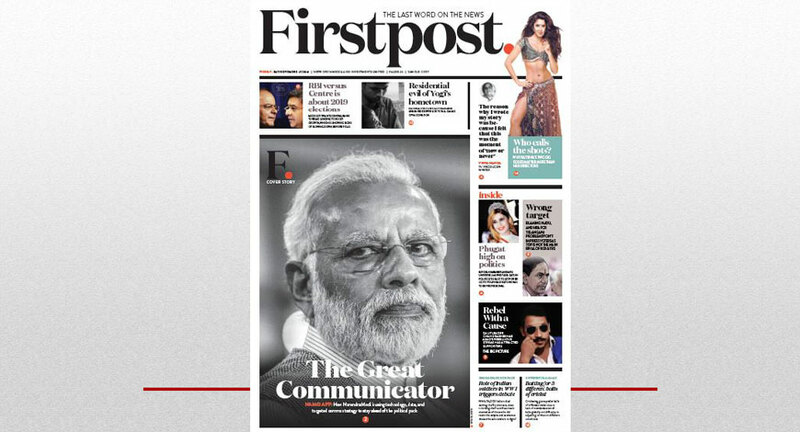 Aiming to change the way in which the consumer perceives newspapers, Firstpost emphasises on narrative, long-format journalism with a focus on national politics, culture and art and being a mix of hard and soft feature news. With a strong and vibrant design, the newspaper has been designed by Jacek Utko.